Cup of Coffee 6/18: The Lowell Spinners edged out a 1-0 victory on opening night behind Michael Kopech. Aaron Wilkerson (pictured) and Mitch Atkins pitched Pawtucket and Portland to victories, but Greenville and the DSL teams suffered losses. The Louisville Bats could not live up to their name against Aaron Wilkerson, who continued to dominate since his call-up to Triple-A. Wilkerson tossed seven innings of one-run ball, striking out nine and walking two. By the time he left the game after 102 pitches, the Pawtucket offense had all but assured his victory. Ryan LaMarre and Chris Marrero blasted two-run home runs within two batters of each other in the third inning, and Deven Marrero piled it on with a two-run triple later in the frame to push the PawSox lead to 7-0. Mike Miller contributed the final two PawSox runs with a groundout and a single. Every member of the lineup hit safely to back up Wilkerson’s gem. Chris Marrero led the way with a 2-for-3 night, including three RBI. With two outs in the top of the eighth, Andrew Benintendi broke a 1-1 tie with an opposite field double to score Tzu-Wei Lin. Benintendi continued his recent upturn with a pair of doubles, his fifth multi-hit game in his last seven contests. Catcher Jake Romanski ripped a double and a single, scoring a run and upping his season average to .315. Cody Decker homered in the ninth for good measure, and the Sea Dogs' pitching staff quieted Richmond all night. Mitch Atkins allowed a single run in 5 2/3 innings but left with a no-decision in the low-scoring contest. Williams Jerez was the pitcher of record after a critical 2 1/3 innings of relief, surrendering only a single hit. Chandler Shepherd slammed the door with a 1-2-3, two-strikeout ninth. The Salem Sox could not get the offense off the ground Friday. With Yoan Moncada sitting out again with normal wear and tear, the lineup amassed just four hits while the Dash roughed up starter Jalen Beeks and reliever German Taveras. Beeks allowed three runs on five hits and three walks through 4 2/3 innings, allowing most of the damage in an ugly third inning. Taveras surrendered three runs of his own in only 1 2/3 innings. Catcher Ben Moore had a pair of singles for Salem while Mauricio Dubon chipped in a sacrifice fly. Despite the hitting woes, Salem did swipe five bags, including Dubon’s 23rd and Danny Mars’ 20th. The wheels fell off for Anderson Espinoza in a four-run fifth as the starter’s struggles led to a 6-1 loss for the Drive. Espinoza limited the damage through the first four innings, but he was pulled after allowing a run and loading the bases in the fifth. All three runners came around to score against reliever Trevor Kelley, driving up Espinoza’s ERA to 4.06 on the year. Josh Ockimey doubled and walked on an otherwise quiet game for the Greenville offense. Michael Chavis had a particularly forgettable performance, finishing 0 for 3 with three strikeouts. The Drive’s only run came when Luis Alexander Basabe grounded out to score Ockimey. The Hagerstown lineup beat up on Drive starter Roniel Raudes in the nightcap just as it had done to Espinosa in the opener. Raudes was tagged for eight hits and four runs and could not get out of the fifth inning. The Suns jumped to a 3-0 lead after two innings, and the scuffling Greenville offense did not mount a counterattack. Ockimey and Tate Matheny were the lone bright spots for the offense. Ockimey reached in all four plate appearances with a double, a single and two walks, and Matheny went 2 for 3 with a stolen base the team’s only run. Kyri Washington went a combined 0 for 7 on the day from the cleanup spot. Opening Night for the New York-Penn League brought plenty of excitement but not much offense. The Spinners trotted out sixth-ranked prospect Michael Kopech to start the opener, and the righty answered the call with 4 1/3 innings of scoreless ball. Kopech’s fastball sat in the mid-90s, climbing as high as 99, but control problems led to four walks. Reliever Pat Goetze picked up the win with 2 2/3 scoreless innings out of the pen, allowing three hits but no walks. Dioscar Romero was dominant on the back end, striking out four in two innings of one-hit ball. Lowell racked up seven hits, but could only push across a run in the fifth when leadoff hitter Chris Madera singled up the middle to score catcher Isaias Lucena. Left fielder Tyler Hill and third baseman Roldani Baldwin each went 2 for 4 on the night. It was an ugly first inning for Red Sox starter Edilson Batista, who pitched only the opening frame after allowing four runs on five hits and a walk. The DSL Phillies managed two more off Eduard Bazardo over the next three innings and then tagged reliever Manuel Ramirez for four more in the eighth. Red Sox offense rallied for four runs in the eighth and 13 hits overall but it was not enough to overcome the early deficit. Shortstop Ricardo Cubillan went 3 for 5 with an RBI and a run, and Willis Figueroa scored three runs during his 2-for-4 night that including a steal of home. The Phillies outhit the Red Sox 13-4, but timely hitting for the Red Sox kept them in the game. Eduard Conde’s two-run double in the seventh was the biggest hit for the Red Sox, who fell behind in the bottom of the first and never closed the game. Conde was the only member of the team to reach base twice. Everlouis Lozada, Pedro Castellanos, and Ronaldo Pulgar each went 1 for 4. Starter Yorvin Pantoja worked through a rocky first inning to complete four innings before giving way to Rayniel Moreno, who allowed just one run in the final four innings. Player of the Night: After seven innings of one-run ball Friday, Aaron Wilkerson continued to show that he belongs in Triple-A. In his last 13 innings, he has allowed one run and struck out 16 batters. 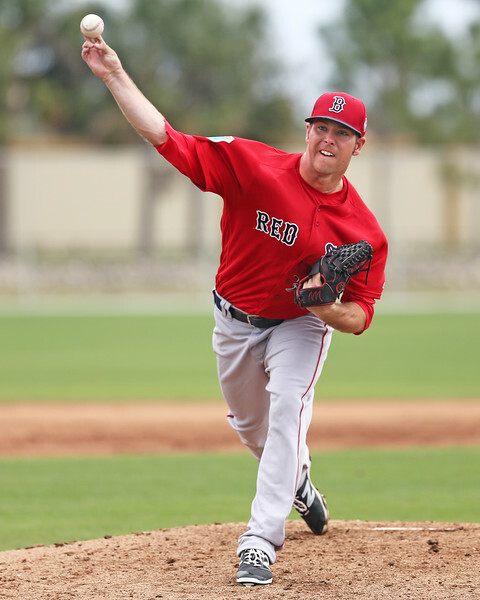 He continues to be one of the best arms in the Red Sox farm system. His ERA sits at 2.03 after six games with Pawtucket, and he has allowed 16 earned runs in 14 games between Double-A and Triple-A this season.